The general public is invited to attend the following events as part of the iEARN International Conference and Youth Summit. All other events and sessions are reserved for registered conference attendees. The community is invited to join us for International Culture Night in the Patsy Cline Theatre at John Handley High school. 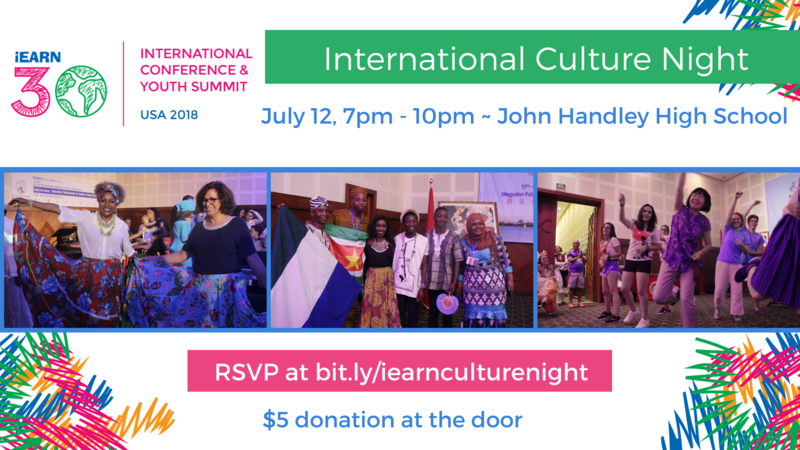 Attendees from the 2018 iEARN International Conference and Youth Summit, representing more than 50 countries, will share short presentations or cultural performances from their country or culture. Past events have included dance and song performances, karate demonstrations, fashion shows, and mini game shows. General admission is free, with a $5 suggested donation at the door. To RSVP please visit: bit.ly/iearnculturenight.